This is not from The Onion, this is from his twitter account, I simply copy-pasted. 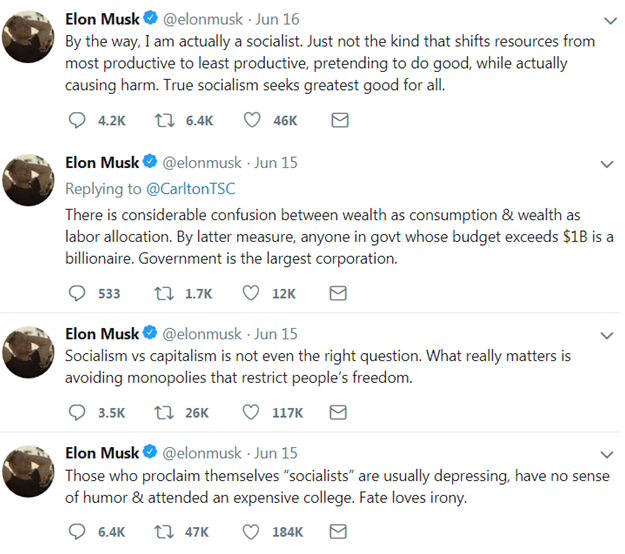 A friend suggested that perhaps Elon associates himself with "voluntary socialism". For me that term is an oxymoron, a contradiction in terms, it does not exist. Socialism by nature is never voluntary, it is done by coercion, by force. The state will socialize the means of production -- land, factories, etc, by force and legislation. Voluntary giving like the Gates Foundation, many others is the one that is voluntary. No one put a gun on the heads of those people and their donors to give away their own money, those folks just think that being the "richest man in the cemetery" does not make sense, so they give away their money, time and other resources while they are still alive. Notice also that he has different definitions of "socialists" in just 2 days. June 15 socialists means people with "depressing, no sense of humor" and June 16, socialists means people seeking "greatest good for all." Meanwhile, here's the latest paper from zerohedge about the man.